Ever hear about the Ray Cat Solution? Check out 99% Invisible for an excellent introduction to Ray Cats. Ray Cats are oddly-coloured domestic felines that considered to be good luck by wasteland-dwellers. Their most notable feature is that Ray Cats change colour when exposed to Creep. This makes them the living equivalent of Rad Tabs – scavengers who observe a Ray Cat change colour are allowed an additional Skill check to avoid Creep Contamination (this does not stack with Rad Tabs or Geiger Counters). Ray Cat (#Enc 1 or 2d6): HD 1d4, AC 6, MV 6″, SV +0, claws (melee Atk +0, 1d2), 25 XP. Creep Detector. Individual Ray Cats may possess additional mutations. Another post related to an old game of mine – this time its from the Scorched Earth PbP. Mongoliants are originally from Darwin’s World. They already slipped onto the Humanoid Encounters supplement, but are getting their own writeup. Mongoliants are giant mutants. These deformed creatures are typically underground dwellers, but sometimes they have been known to inhabit old areas of strong radioactive concentration (including waste dumps, sewers, etc). Mongoliants generally shun light but are not actually adversely affected by it (unlike many subterranean creatures). No two Mongoliants look alike, though their general hunched-over figures and deformed appearance is universal. Mongoliants are, generally speaking, quite stupid, making use of only the most primitive tools. Some few Mongoliant communities have managed to figure out more advanced technology, however, and use this newfound knowledge (and newfound egotism) to conquer other, meeker races for consumption or booty. No groups of Mongoliants are known to foster kindness or respect for other communities. Mongoliant (#Enc 1d4): HD 5d8, AC 6, MV 9″, SV +5, by weapon (typically melee Atk +5, 1d12 or ranged Atk +5, 1d8), 500 XP. Additional eyes (reduced chance to be surprised), infravision (range 6″), gigantism (increased melee damage). Mongoliant Berzerker (#Enc 1d2): HD 6d8, AC 5, MV 9″, SV +6, Giant Maul (melee Atk +6, 1d12), 650 XP. Additional eyes (reduced chance to be surprised), infravision (range 6″), gigantism (increased melee damage), Berzerk (advantaged in melee combat). Mongoliant Khan (#Enc 1): HD 8d8, AC 4, MV 9″, SV +8, Energy Pike (melee Atk +8, 1d12 plus SV vs. stun) and Gauss Needler (ranged Atk +8, 2d6), 900 XP. Additional eyes (reduced chance to be surprised), infravision (range 6″), gigantism (increased melee damage), Accumulated Resistance (+2 vs. disease, poison, & Creep), Additional Arm (can wield another weapon). Mongoliants habitually collect small trinkets; roll once per creature. They despise pure-strains and will eat them first. Individual Mongoliants often possess additional mutations (accumulated resistance and additional arms being the most common; 3-in-6 chance). Mongoliant colonies can include up to 5d4 individuals. They prefer to fight through brute force, utilizing strength and numbers to win the day. 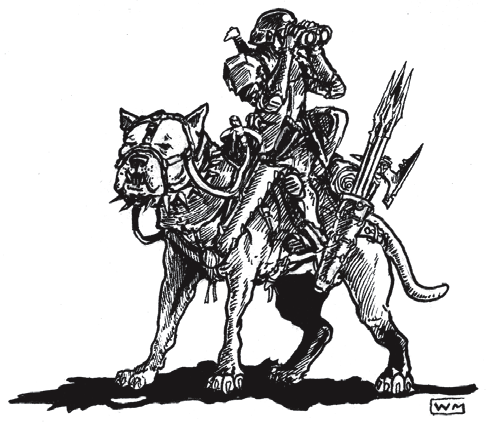 Canines of various types survived and proliferated in the mutant future. Domesticated dogs have stood right next to humanity through the dark centuries, cowered in deep-earth bunkers, drifted in orbital stations, and plodded along next to him through the debris and skeletons of the tortured world. Game statistics depend on the dog’s size. 1-HD creatures represent smaller breeds, runts, or pups. 2-HD mutts are “normal”-sized dogs, while 3-HD specimens are larger breeds. Mutt (1-HD) (#Enc 1d8): HD 1d6, AC 7, MV 15″, SV +1, bite (melee Atk +1, 1d6), 80 XP. Mutt (2-HD) (#Enc 1d6): HD 2d6, AC 7, MV 15″, SV +2, bite (melee Atk +2, 1d6), 160 XP. Mutt (3-HD) (#Enc 1d4): HD 3d6, AC 7, MV 15″, SV +3, bite (melee Atk +3, 1d6), 240 XP. A dog handler may select these above creatures as canine companions. Unlike wild creatures, dogs from Tau will not possess the “Creep-Resistant” trait and will be susceptible to mutation. Coydog (#Enc 2d4): HD 2d6, AC 7, MV 15″, SV +2, bite (melee Atk +2, 1d6), 200 XP. Possibly diseased (1-in-6). Blink Dog (#Enc 4d4): HD 2d6, AC 5, MV 15″, SV +2, bite (melee Atk +2, 1d6), 250 XP. Blink (short-range psionic teleport, advantage to melee attacks and reflex saves, can flee combat). Ruin Wolf (#Enc 1d6): HD 3d6, AC 5, MV 15″, SV +3, bite (melee Atk +3, 1d6), 300 XP. Rabid (advantaged in melee combat). Riding Dog (#Enc 1d6): HD 3d8, AC 7, MV 15″, SV +3, bite (melee Atk +3, 1d6), 300 XP. Can be ridden as a mount. Dog handlers can train wild dogs as canine companions, but they are considered 1-HD higher. Individual creatures may possess additional mutations. 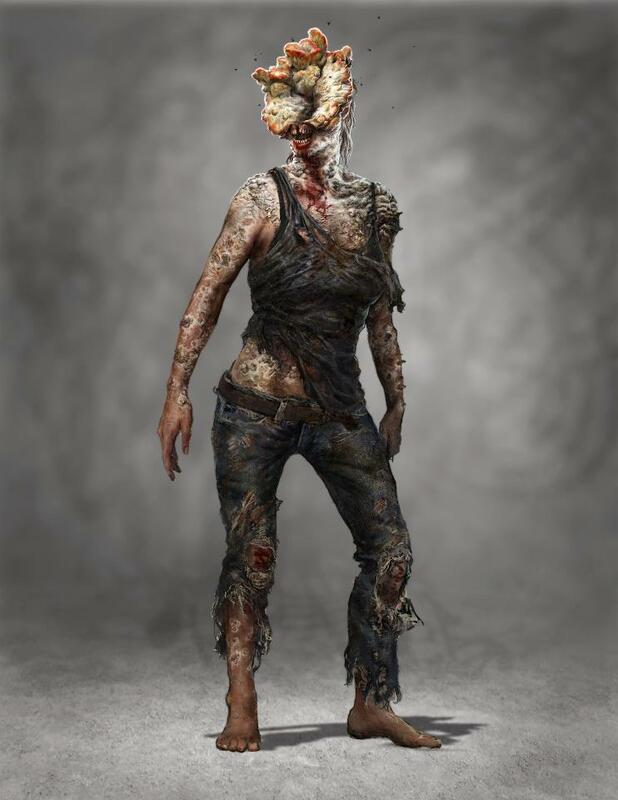 The Cordyceps Infection causes humans to undergo a strange transformation. It is induced by a mutated strain of Ophiocordyceps unilateralis. Over time, the hosts’ physical appearance changes. Fungal growths make their faces completely unrecognizable. At later stages, fruiting bodies erupt from their heads, and more fungi can be seen along their skin. Eventually, they die and become spore-producing cadavers. This fungal infection spreads via spores. These are typically delivered through bite wounds, claw attacks, or simply by breathing them in. 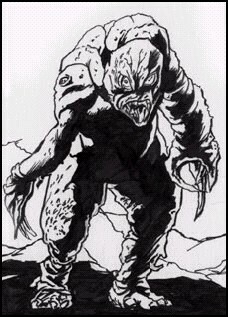 Today’s creature feature is more of a “toolkit” post on how to utilise the Mutational Evolution guidelines to create new and unexpected mutants to harass PCs, with Yellowjackets as an example. Yellowjackets are the scourge of the summer skies, attacking humanoids for no apparent reason. These 12″ long insects are belligerent, bloodthirsty, and pumped up with rage. 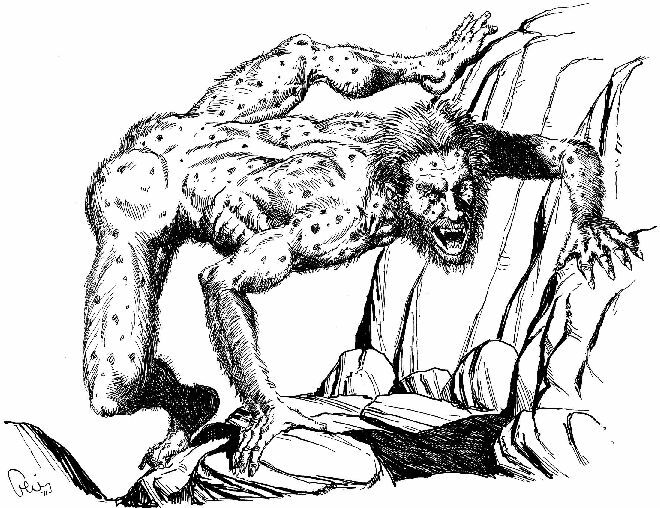 They nest in large hives in ruins, under bridges, or on cliff faces; a hive contains about 4d10 members. Anything that comes within 100 feet of a nest brings out the entire hive in a killing fury. 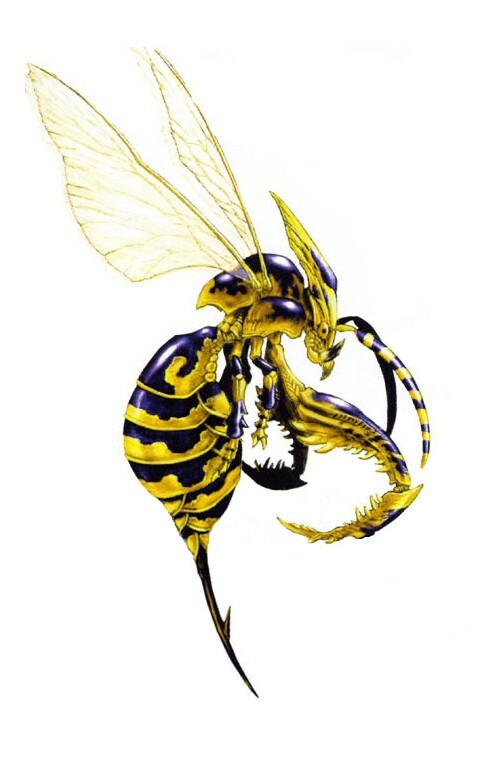 Yellowjacket (#Enc 1d6): HD 1d4, AC 5, MV 15″, SV +0, sting (melee Atk +0, 1 + poison), 100 XP. Poison sting (2d6 damage, fortitude save for ½), frenzy (advantaged in melee combat). Firecracker (#Enc 1d4): HD 1d4, AC 5, MV 15″, SV +0, sting (melee Atk +0, 1 + 1d6 fire damage), 100 XP. Burning sting (1d6 fire damage), explosive (explodes for 2d4 damage if exposed to extreme heat or open flame; reflex save for ½). Spark Wasp (#Enc 3d4): HD 1d4, AC 5, MV 15″, SV +0, sting (melee Atk +0, 1 + stun), 50 XP. Stunning sting (fortitude save vs. stun), susceptible to infection (-4 on saves vs. disease). Additional strains have also been reported, each exhibiting its own particular colouration. This creature is swiped from Other Dust by Sine Nomine. You can check out my earlier review for the game. UPDATED 08-Sep-13: I’ve swiped the Harvestman from Savage AfterWorld because the picture is so creepy. A particularly nasty mutant flaw leaves Skewmen with strangely-jointed limbs and a great difficulty in standing upright. Furry pelts, scales, and other cosmetic epidermal changes are often experienced as well. Skewmen are forced to creep and scrabble through the wastes, reliant on crude clubbing weapons that can handle the abuse of their locomotion. Most Skewman tribes hate the “upright”, and blame them for their twisted condition, crediting their evil ways with bringing the curse down upon the innocent ancestors of the Skewmen. Skewman (#Enc 2d6): HD 1d8, AC 8, MV 6″, SV +1, club (melee Atk +1, 1d6) or rocks (ranged Atk -1, 1d4), 75 XP. Aberrant deformity. Individual Skewmen often possess additional mutations (thick hide and scaly armour being the most common; 3-in-6 chance). Some also have the ability to scale walls like a gecko (6″ climb speed; 2-in-6 chance). Skewmen tribes may number up to 4d10 individuals. Some groups make a point of enslaving the “upright”, committing gruesome surgical atrocities on these wretched prisoners in order to leave them more like their captors.